We selected the Barbecook Smoker XL BBQ for the Wallers garden because it is the most multi functional BBQ we have ever seen. It not only smokes and cooks your food…but the top half comes off and it turns into a fire pit! The XL Smoker is made of painted steel with an enamelled bowl with a round hanging rack for hanging up fish and meat. There are two adjustable air supplies at the top and bottom of the BBQ and this extra oxygen is let into the smoker, generating more smoke which gives more flavour to the food.There’s also a grill basket with a fine mesh to smoke even the most delicate of ingredients. The XL smoker is a combination smoker and fire pit. For this you only need the bottom part, in which you put logs which you then light with lighter cubes. You can use the adjustable air supply at the bottom to add extra oxygen to the fire. When finished, you can brush the ashes into the ashtray, which can easily be removed for cleaning. 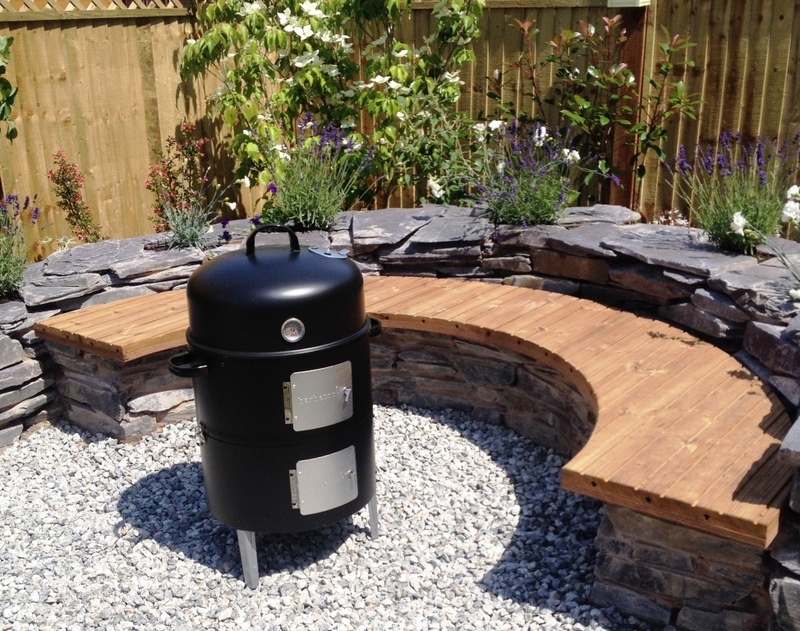 The Barbecook XL Smoker stands 105 cm tall and 52cm diamteter, which is a perfect size for most gardens and is available from £150. 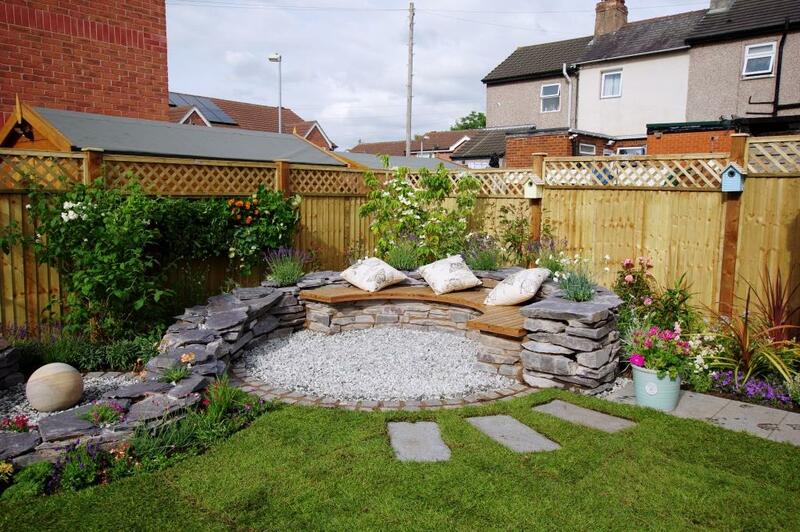 With this garden design, we wanted to build in some seating into the garden and make a real feature of it. We decided to create an ‘S’ shaped wall built from slate which we could not only incorporate a seat, but also plant in pockets created in the wall. Natural Thin Slate Walling is split flat pieces of slate in random sizes and mixed shades of blue, grey and plum. The natural blend of colours made our wall look really natural and they complimented each other beautifully. Each slate piece is split flat from indigenous british slate in random sizes to reveal its natural properties and supplied in easy to order packs. For more information on this and other fabulous landscaping products and to find your local Stonemarket stockist, please go to www.stonemarket.co.uk or use the online stockist search tool. We decided to use decking at the Wallers, because it would enable us to easily build the curved features we were after. Lunawood decking has a long lifespan, unusual for a softwood deck. It is a lovely colour not dissimilar to an expensive tropical hardwood and it is also built using hidden fixings – no more unsightly deck screws. 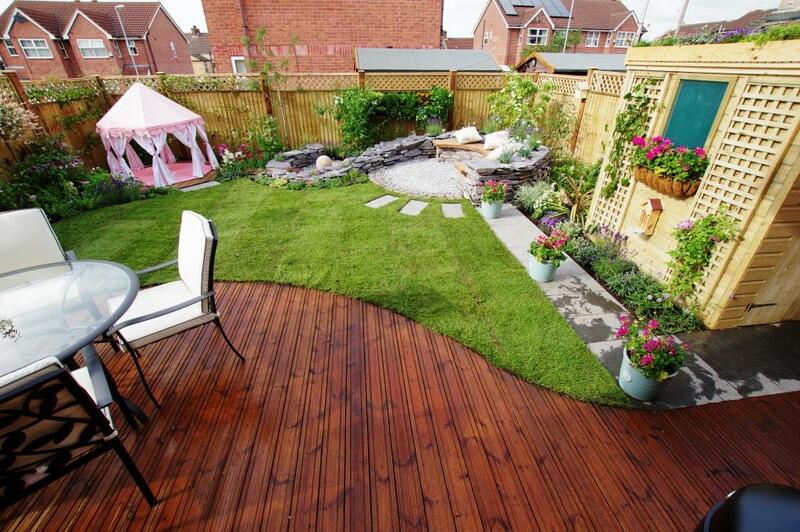 The decking is a premium grade A thermally modified softwood decking otherwise known as thermowood. Q-Deck Lunawood also absorbs far less moisture than regular decking, so there isn’t lots of swelling or shrinkage. This very durable longlasting decking comes with a 20 year warranty against fungal and insect attack, which we think is incredible for a softwood. It performs in a similar way to costly cedar – even fading to a gentle grey colour. Another added bonus of this decking is being able to add grip to your deck. Where required, the easy to apply Q-Grip Strips fit into the two specially profiled grooves. We applied these to the steps in the Waller’s garden, where grip is essential. We wanted the girls to have their own little hideaway and play den so the Pavillion Children’s play tent is perfect for them. It’s the most luxurious children’s tent we could find! Billowing canopies with open sides to take in the view or tuck yourselves in for a spacious den – a perfect for summer fun! 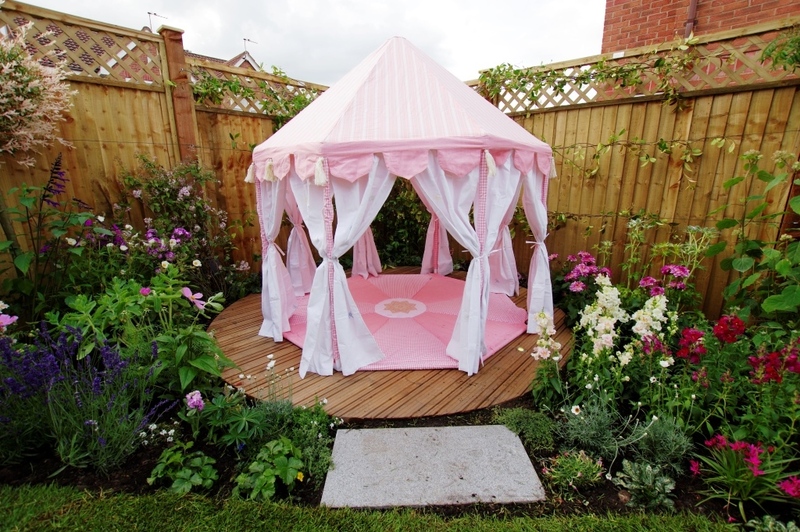 The outdoor play tent comes complete with a matching lightly padded floor quilt and is decorated with tassels and colourful dragonflies on the floaty cotton curtains. We added some cushions to make it nice and cosy. The pavilion tent is easy to assemble with a light metal frame and comes with a convenient storage bag. We chose the rose pink colour, but it also comes in willow green. We needed an attractive fence for the Waller’s garden and the Forest Lattice Fence Panel fitted the bill. As their garden is so small, it was important that the fence looked attractive in its own right. This pressure treated softwood panel has a lovely delicate lattice trellis integrated into the panel, which is not only visually appealing but also great to train climbers through. The fence is pressure treated for longer life which eliminates the need for annual re-treatment. It comes in two sizes 1.83m x 1.83m and 1.52m x 1.83m. We finished the fence off with post caps to prevent the rain from entering the grain of the posts and to give a smart finish. 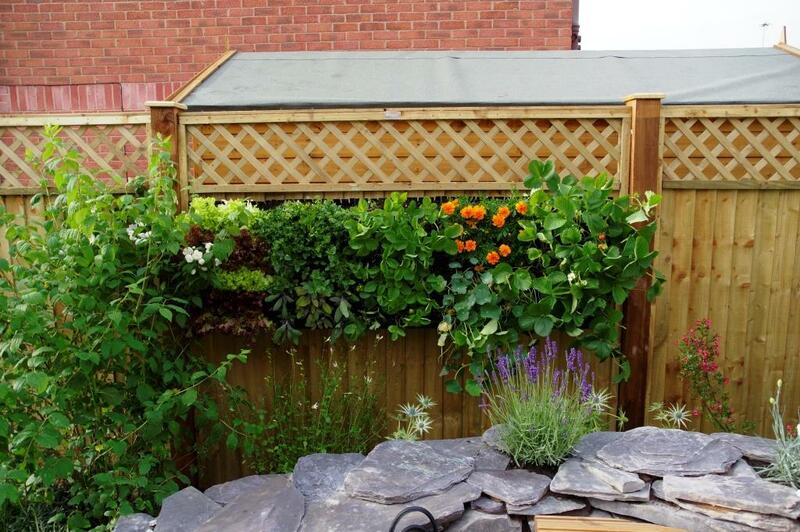 The 1.83m x 1.83m Forest Lattice Panel retails from £67.99.